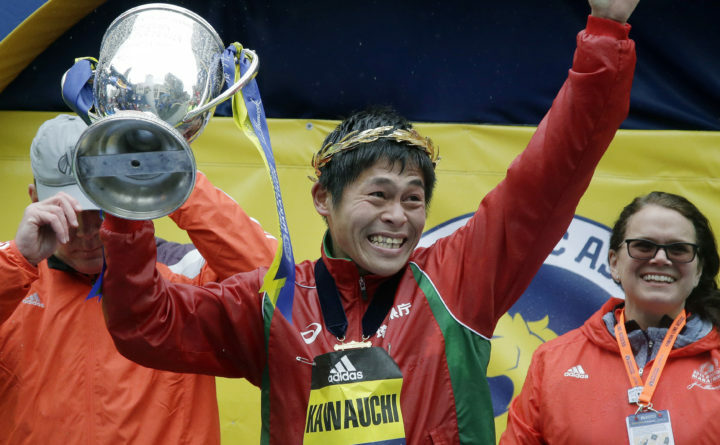 Yuki Kawauchi of Japan hoists the trophy after winning the 122nd Boston Marathon on Monday in Boston. He is the first Japanese man to win the race since 1987. BOSTON — Japan’s Yuki Kawauchi surged with a mile to go to overtake Geoffrey Kirui to win the Boston Marathon on Monday. Kawauchi crossed the finish line in a time of 2:15:58. He becomes the first Japanese man to win Boston since Seko Toshihiko took the title in 1987. Kawauchi said through an interpreter that the wind and cold were the “best conditions possible” for the race. Kenya’s Geoffrey Kirui was second in 2:18:23, followed by American Shadrack Biwott in 2:18:35. Biwott’s result marked a huge day for the American men which placed three runners in the top 5. It marks the second straight year that six American runners placed in the top 10. Tyler Pennel was fourth (2:18:57) and Andrew Bumbalough finished fifth (2:19:52). Meanwhile, the usually strong Kenyan team had only one runner — Kirui — in the top 10. It is the first major title for Kawauchi. Kawauchi sprinted out to an early lead before falling back. Fighting rainy conditions and a heavy headwind, he surged several times during the race. Though he had never won a major marathon crown, the 31-year-old had captured more than 30 marathon titles in career. He ran 12 marathons in 2017 alone, winning five.